As Ted, a responsible citizen and a family man, you are faced with a slight disturbance to your happy, suburban lifestyle. THE NUCLEAR APOCALYPSE. With only 60 seconds left to impact, guide Ted in a mad, intense and action packed dash through his house in search of his family and useful supplies. Everything will be against you - time, your very own furniture, the house that's different every time you play and the fundamental question - what to take with you and who to leave behind? Reaching the fallout shelter in time and alive is only the beginning. Whatever you scavenged and whoever you saved will play a vital role in your survival. Each survival story will be different, with every day surprising you with unexpected events. Will all of these stories end well? It's up to you. Ration food and water, make best use of your supplies, face difficult choices and even venture into the wasteland. 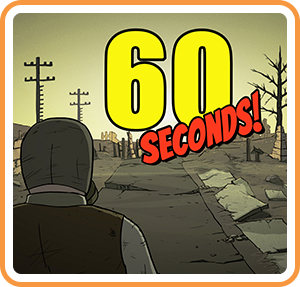 Where can I buy 60 Seconds! physical/digital?